If astrology is scientific and the stars or planets that people are born under influence their lives for good or evil it would be important to delay or induce babies' births accordingly. A long-ago Investigator Magazine investigation into this matter has turned out prophetic in that the astrological timing of births is now occurring, particularly among Hindus! I respectfully request an answer to a question that has serious implications. Michel Gauquelin, a French scientist now deceased, is noted for discovering the alleged "Mars effect". He correlated the positions of the planets with the moment of birth of famous/talented people. Obstetricians, nowadays, can induce or delay labour, safely by weeks. This is enough variation to change the constellations and planets a baby is born under and hence whether he'll be rich or poor, famous or ignorant, talented or stupid, etc. Get the timing wrong and a life is ruined! In view of the popularity of astrology it may not be long before society's failures sue obstetricians for letting them be born under an unlucky star and denying them the good life that the planets of a week earlier would have bestowed. All this places an awesome responsibility on persons in charge of maternity wards and I would like to know what's being done about it at the Queen Elizabeth Hospital. A reply from the QEH was received and requested: "scientific evidence showing that delaying, or delivering early, changes a person’s future personality." If the stars and planets influence our general course in life as well as daily events then it is important to time the birth of babies as well as of surgical operations not by the urgency of the case or by the availability of beds or surgeons but by the calculations of astrologers! If the Q E H has an Ethics Committee you will surely want to bring this crucial point to their attention! No further response from the QEH was received. Of course the 1991 investigation was "tongue in cheek". 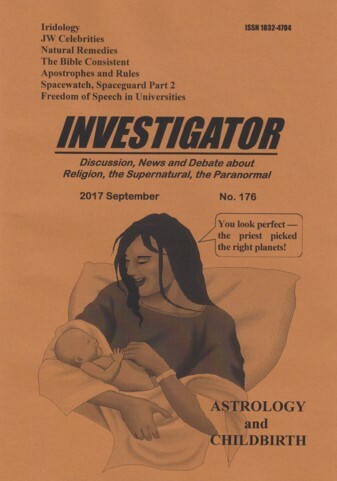 In Investigator #8 astronomer Michael O'Leary had referred to astrology as an "ancient superstition", given evidence against it, and concluded that "a little knowledge of Astronomy" exposes astrology "as an absurdity." The implication for childbirth in the letters to the QEH was merely another way of suggesting that astrology is unscientific, therefore irrelevant in medical practice, and rightfully ignored whenever anything important is at stake. Astrology remains an important facet of Hindu folk belief in contemporary India. Many Hindus believe that heavenly bodies, including the planets, have an influence throughout the life of a human being, and these planetary influences are the "fruit of karma." The Navagraha, planetary deities, are considered subordinate to Ishvara, i.e., the Supreme Being, in the administration of justice. Thus, these planets can influence earthly life. In 2012 The Economist published a report on "Medicine and Astrology". • Many Hindus hold strong astrological beliefs and may believe the movement of the planets has a strong influence on health and wellbeing. • Patients may wish to schedule appointments or surgeries according to these beliefs. Several decades earlier astrology believers were estimated at 30% — therefore seem to be increasing. Investigator's 1991 investigation seems to have been prophetic. With Hindus in Australia increasing, and astrology believers already numbering over 40% of Australia's population, the timing of births to coincide with favorable planets and stars could become serious medical and legal issues!